The smartest connected scales pair well with a hefty side of the best food logging app. That’s why we teamed up with MyFitnessPal to bring you today's special: nutrition and activity tracking integration. Check out the new nutrition features available in Health Mate and get tracking. We’re excited to be able to offer you a comprehensive food logging experience through our friends at MyFitnessPal. Interested to see how the new integration works? These three simple steps will get you tracking in no time. When starting a weight loss journey, it’s important to understand what your goals are. The first step to achieving your goals is setting them in the Health Mate app. You can choose the amount of weight you would like to lose and the select a pace you are comfortable with. Once this weight goal is set, Health Mate and MyFitnessPal will build you a daily calorie allowance to help you reach your target weight in the specified time frame. 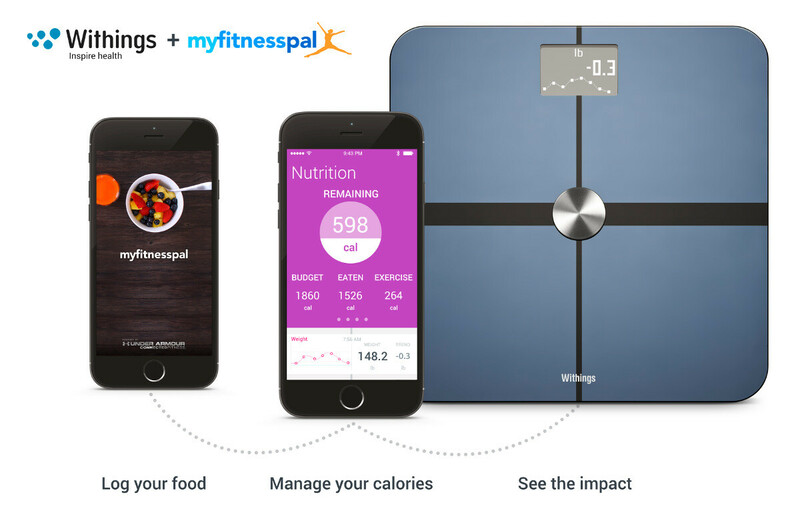 We’re thrilled to be working with MyFitnessPal, the best-in-class food logging app. MyFitnessPal is proud to offer the largest food catalog and offers an experience that is not only seamless, but as detailed as possible. Thanks to the comprehensive catalog, you can log your meals in just a few seconds. You can access your MyFitnessPal account directly from the Nutrition widget in Health Mate, or simply open MyFitnessPal’s app. Your total budget, calories consumed, and remaining calories will be automatically updated in the Health Mate app to reflect your meals. This new update will also give you access to a breakdown of the nutrients you consume, and a breakdown of calories by meal. Now you can make sure you’re getting your fair share of Macronutrients (proteins, carbohydrates, fats), as well as Cholesterol, Sodium, Potassium, Iron, Calcium, and Vitamins A and C.
You can link Health Mate to MyFitnessPal or set up your free MyFitnessPal account here. MyFitnessPal tracks the calories you’re taking in, while Health Mate tracks the calories you’ve burned. Use a Nokia tracker or Health Mate’s in-app tracking feature to monitor your activity levels. Having access to the amount of calories you are burning each day will allow for adjustments to your daily calorie budget. The more you burn, the more you can eat. Tracking weight, nutrition and activity enables Health Mate to become a complete diet coach. Manage your calorie intake, see the impact nutrition has on your weight, and “earn” extra calories based on your activity levels. Weight tracking, nutrition tracking and activity tracking are a triple threat when it comes to empowering and inspiring you along the road to better health. Why should you bother logging your meals? A study we conducted with MyFitnessPal revealed that people who log their meals and regularly monitor their weight shed the most pounds.